Palestinian civil society organizations have written an open letter to the EU asking for an end to EU funding to Elbit Systems and other Israeli military and security companies. They argue that: Considering the repeated and systematic acts of aggression, war crimes and violations of international law committed by Israel, the exclusion of Elbit Systems or other Israeli military and homeland security companies from the Horizon 2020 framework seems a necessary step towards an EU policy that effectively promotes human rights and international law in Palestine." See the full text of the letter here. As Palestinian civil society organizations we address you regarding Israeli participation within the new Horizon 2020 program. Considering the repeated and systematic acts of aggression, war crimes and violations of international law committed by Israel, the exclusion of Elbit Systems or other Israeli military and homeland security companies from the Horizon 2020 framework seems a necessary step towards an EU policy that effectively promotes human rights and international law in Palestine. Elbit Systems is Israel’s largest military company and its drones, weapons and other technology is a key part of Israel’s military apparatus and participates with the construction of Israel’s Wall, which was ruled illegal by 2004. Elbit Systems technologies have been developed during the course of Israel’s military actions and the company markets its technology as “field tested”, by which it means its technology has been tested on Palestinian civilians. Any funding to or cooperation with Elbit Systems represents a form a support for activities and its contribution to Israeli violations of international law. The Stop the Wall study analyzes the company's participation in the Horizon 2020 process, in particular the Horizon Space program, and details how Elbit Systems and other Israeli military and security companies are applying and have been approved for participation in Horizon 2020. On February 9, the Israeli R&D Directorate for the European Research Area (ISERD) published a document announcing that the EU had already approved 162 projects with Israeli participation within the Horizon 2020 research cycle with a total value of €452.3m. [ii] A number of these projects are in the field of space and other sectors that include homeland security and dual use technology. The evaluation process of the new Horizon Space program is starting in April. Other evaluation processes appear to be already ongoing. We therefore stress that any military relations with Israel inherently support Israeli military aggression and other violations of human rights and international law. In 2014 over 60,000 people including Nobel Laureates, artists and public intellectuals issued a letter calling for an immediate military embargo on Israel. The letter underlines that “Israel’s ability to launch such devastating attacks with impunity largely stems from the vast international military cooperation and trade that it maintains with complicit governments across the world." Any decision by the EU commission to fund cooperation with Israeli military and security companies would amount to a form of support for Israeli military aggression. the EU’s general commitment to upholding and promoting international law, as set out in the Treaty of the European Union. the EU’s own commitment not to fund dual use technology. Since January 2014, the European Union has guidelines in place to regulate the eligibility of Israeli entities for funding schemes and financial instruments of the EU. These guidelines ostensibly aim at ensuring “the respect of EU positions and commitments in conformity with international law”. They further show that the EU recognizes its political responsibility and obligation to respect international law when it awards funds, grants or prizes to Israeli entities. By providing funding to Elbit Systems, it would be ignoring these obligations. If the EU wants to have an effective role in the diplomatic processes regarding Palestine and the region, it cannot allow Israeli military companies at the heart of Israel’s grave violations of international law and whose technological advances have been developed as a result of Israeli aggression to participate in EU programs such as Horizon 2020. 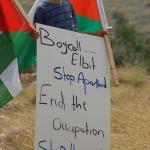 We therefore ask you to take these arguments into due consideration and stop any cooperation with Elbit Systems and other Israeli military and homeland security companies within Horizon 2020, as a necessary step towards an EU policy that effectively promotes human rights and international law in Palestine. Looking forward to your detailed reply to the issues raised.